making it sparkle like its namesake. The name "cat's-eye" ordinarily refers to cat's-eye chrysoberyl. This gemstone is named after the cat's-eye appearance of the single sharp, vertical line displayed when light is reflected off its surface. The ancient Romans were familiar with cat's-eye chrysoberyl by the first century, and in the East it was believed that pressing a cat's-eye on the forehead between the eyes would endow a person with clearness of foresight. In Sri Lanka, the original historical source of cat's-eye chrysoberyl, it was believed to offer protection from demons. The most desirable cat's-eye chrysoberyls show a distinct band of light centered on the cabochon's surface. As the light source moves, this band also moves from left to right, and the coloration on either side of the band changes. Most highly prized are those that show a honey color on the side closer to the light source and a milky translucence on the far side, as shown in the photograph on the next page. This cat's-eye effect is called "chatoyancy," derived from chat, the French word for "cat." Chatoyancy is caused by numerous parallel, needle-like inclusions within the stone. Light reflected off these inclusions is focused by the cabochon's curved surface, causing the chatoyant band to appear. If the cabochon surface is too high, a sharp band still appears, but it will not move back and forth. A low cabochon surface makes the band wavy and indistinct. On poorly cut stones, the band may be off-center or run diagonally across the stone. Cat's-eye is a variety of the mineral chrysoberyl, as is alexandrite, which changes color between incandescent and fluorescent lighting. The rare cat's-eye alexandrite exhibits both effects simultaneously. At the auction houses of Christie's and Sotheby's, men's rings set with cat's-eye chrysoberyls exceeding five carats occasionally come up for sale. Although cat's-eye chrysoberyl is a gemstone favored by men in the United States because of its exceptional durability, in Japan, relatively small cat's-eyes weighing two to three carats are often fashioned into and sold as women's rings. 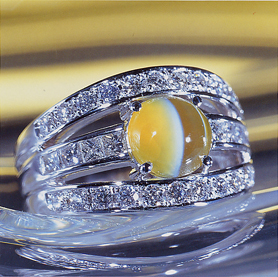 The current major sources of cat's-eye chrysoberyl are Sri Lanka, Tanzania, Brazil, and India.